The Unknown Studio turns one this week. Today, in fact! A few of the articles we’ve published this week are celebrating this fact, with a look back on what we’ve accomplished over the year. Today’s installment is all about the podcast. Yes, friends, today marks our official first birthday. The Unknown Studio turns one today — sometime later this afternoon to be precisely. And though we’ve already done a bit of a summary of the last year, using data from the ever-popular Fast Fifteen, I thought I’d get into a few more details about the show’s successes. As we’ve explained before, this whole concept started at a tweet-up. It was all downhill from there. We started the show using the LibSyn podcasting service — which served us very well for a time… But eventually we wanted to host everything ourselves, with our own website, theme and all. That’s what you’re looking at right now. We’re up to an average per-episode download rate of 544. We’ve gone from tens of listeners to fifties of listeners. And just so that our guests can gloat amongst themselves, these are the top-five, most-downloaded episodes, starting with most downloaded. It’s been a hell of a year, going from tens to fifties of listeners. I don’t think Scott and I ever set any formal benchmarks for success… Mostly because we didn’t really know what would actually make a good benchmark. Given that our show’s content is focused on Edmontonians and things taking place here in the city, I think we’ve been damned successful. Especially given the fact that our fifth most downloaded episode occurred as a result of a guest fully jamming out on us. Which was fine in the end — it turns out Scott and I can handle a whole show on our own… And that sort of brings us to the future of the show. But we’ll leave that for our last installment, which we’ll be publishing tomorrow. For now, there are a few individuals we need to thank for helping us out along the way. 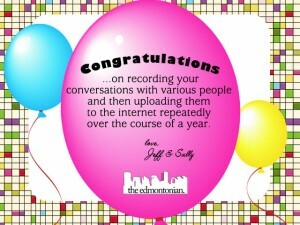 We absolutely could not have done this without: Rachel, Anita, Jeff & Sally, Brittney, Ramin & Cory, Craig, Dave, Adam, Karen, Marty, Brenda, Owen, our wonderful listeners, our wonderful guests, the City of Edmonton (in particular, their communications and traffic departments), 630 CHED and iNews880. And in our forthcoming episode, S02E01, we’ll answer a recent question that’s been asked of us: “Who has been your favourite guest this season?” among other queries. HAPPY BIRTHDAY, THE UNKNOWN STUDIO! I’m not joking around when I say The Unknown Studio is one of my 4 or 5 regular podcast listens. Can’t wait for the new year of shows! Eek can’t wait to hear about the changes you have planned for next year!